Endless Knot to add some Americana & Folk to this year’s festival! If you happened to be listening in to ‘Down The Pub’ on Channel Radio last night, you would have heard that Endless Knot will be joining us at the Festival this year. The band will perform their take on Americana, Folk and Roots influenced music. I managed to catch up with Vocalist and Guitarist Keith and asked him a few questions….. So Keith, this is your first year performing at the festival, how exciting!.. What are you looking forward too? Simply, playing live! There’s a buzz you get from playing in front of an audience, and festivals produce a special atmosphere that you don’t get in a pub or a club. It’s hard to put into words. The festival audience come along wanting to be entertained so hopefully we can do that. So tell us a bit more about Endless Knot? Endless Knot formed early in 2015 when Keith, Derek and Michelle met up and found that they had similar ideas. Ann came on board very shortly with guitarist Martin who brought with them a huge variety of influences. Unfortunately Martin moved to Devon before the end of the year (the length people will go to to get out of being in the band!) However, we quickly found Fred who settled in right away. 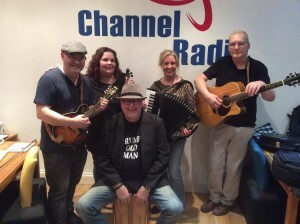 So, Endless Knot play a variety of songs and tunes covering Folk, Folk Rock & Americana styles of music from the likes of Richard Thompson, Steve Earle, The Levellers, Bellowhead & The Saw Doctors. It is vitally important for the whole future of performing arts. Live music thrives from local interest and inspires people to get involved themselves. Music has been part of our lives for as long as any of us can remember, it has enriched us and inspires us in both happy and sad times. Festivals like Festival in the Park make performing arts ‘real’ to everyone who comes along proving that everything is accessible and that anything is possible. As a local band, these festivals give us a much wanted and appreciated platform to perform and entertain. For a local community it’s vital to have such events take place that are made available to ‘all’ rich, poor, old, young etc. It’s an event where everyone can feel part of, where friendships are formed, where new things are discovered. We will bring a joyful blend of Folk & Americana music that will entertain and offer something different to the wonderful festival audience of Ashford. Also, hopefully we will inspire others to start playing an instrument and get involved in music. If only one person picks up an instrument after watching us, then that’s a job well done! …. Oh and hopefully we can bring the sunshine!